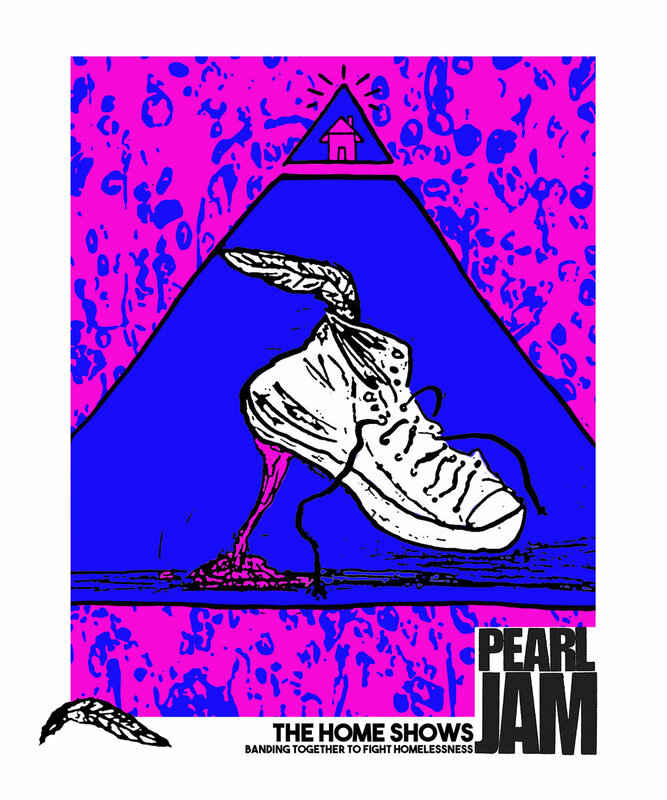 Path with Art Student Artists who have lived experience of homelessness are designing a limited-edition series of posters for partners of Pearl Jam’s The Home Shows. Only two students’ designs will be selected for distribution, but Path with Art will showcase all of the posters the students create starting Thursday, August 2nd at their gallery in Pioneer Square. Mike McCready, the lead guitarist for Pearl Jam, shared his perspective: "I think it’s really important to recognize that people who have experienced homelessness have skills and talents. Art not only breaks down barriers, but can also be a means to heal the trauma that can be caused by experiencing homelessness." The artists who designed the posters come from diverse backgrounds, but the majority have found themselves living on the street at some point in their lives, and all have found solace in the arts. 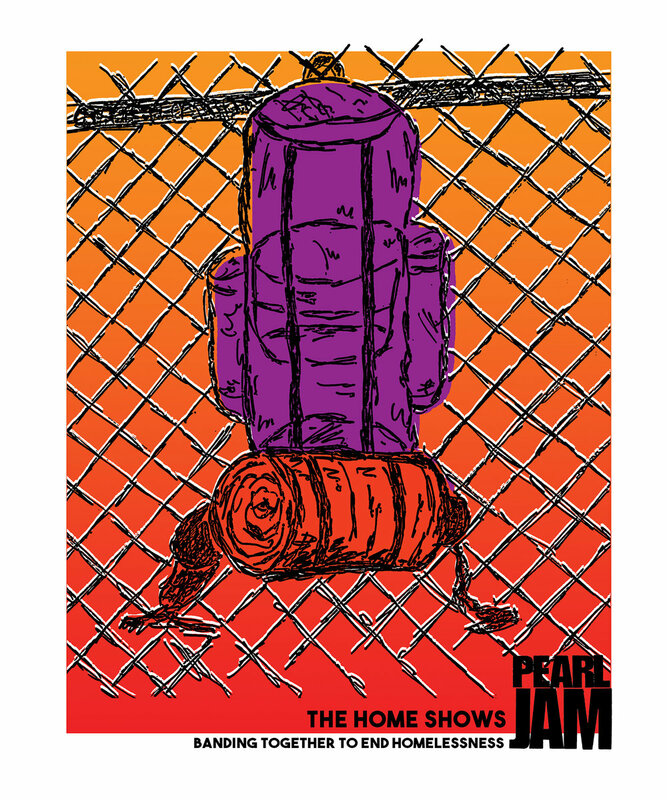 One artist, Aaron, designed a poster around his beloved purple backpack, which was stolen a few years ago from where he was sleeping – under a bridge adjacent to Safeco Field, the site of the upcoming Pearl Jam Home Shows. Path with Art transforms the lives of people in recovery from homelessness, addiction, and other trauma by harnessing the power of creative engagement as a bridge to community and a path to stability. Students are referred to Path with Art from over 30 social service partners in the greater Seattle area. Many of these social services work hard and directly on the issue of housing, but understand homelessness is a complex issue with many facets, and it requires a diverse range of support in response. The posters will be on display August 2nd, 8th, and 10th, 5-7 PM, or by appointment through the month of August at Path with Art (312 2nd Avenue South, Seattle, 98104). Special thanks to Teaching Artist Jennifer Dixon, and Creative Mentors Mimi Dixon-Shapiro and Celeste Osborne for facilitating this project. The Path with Art Singers will performed the National Anthem on July 20th at Safeco Field in honor of Pearl Jam Fireworks Night. Members of Pearl Jam will threw the ceremonial first pitch and the Mariners featured their music throughout the game. Afterward, there was be a special 12-minute fireworks show set to a Pearl Jam soundtrack. Watch the performance here. Two students involved in PwA’s music program who have lived experience of homelessness and Executive Director, Holly Jacobson, spoke to KEXP about the power of music and community for transformation. Interviews will air on August 1st – stay tuned for more updates!